There are a few things I really want to do differently next time when finishing off a piece. I feel like my coils with the wire around the piece aren’t suuuper even, and I can tell one side of the bracelet is a bit thinner than the other – so I think I definitely want to make sure to either cut off the thinner part, or cover it up with the coil better so both sides look more even. I really need to practice making bead caps, too, because I think they look kind of eh lol. I think to fix my coiling problems, I’m going to try and use thinner gage wire next time – I was wrapping the ends with 20 gage, and thought it was a bit too rough on the Viking knit section (like it crushed the thinner side of the knit rotfl), so next time I’m going to try 22 gage and see how it works (I mean I am pretty sure it will work better XD I’d try 24 gage, but I currently don’t have any). Have you ever done any Viking knit pieces? Have any good finishing techniques? Would love to hear about them! I think I’m just going to keep this one for myself, because I tend to do that with the first thing I’ve made, but eventually really want to get to where I feel comfortable with other people wearing/purchasing these! I spent an hour trying to take a picture of these myself because I am stubborn and of course doing so failed miserably so I had my Mom take pictures and she did it in like three tries cruel world XD I feel I should have learned my lesson with trying to take pictures, but darn it I’m stubborn and will conquer taking pics with this webcam blind one day! Personally, I like the one with the jade bead on it a bit more: Which, I find a little funny, because the style came about on accident. I had woven two separate pieces with two base wires, to try and make a bracelet with both pieces. I don’t really like to measure and eyeball things primarily (another habit I probably should get out of lol) and one piece was bigger than the other. I figured, ok, I could make one of these the focal for the bracelet instead, and made one a coil that’s waiting in the wings for just that. But with this one, I figured, why not coil it, and play around with it to make a pendant? The bead was added primarily as an afterthought: I wanted to stabilize the top wraps, and hide the weaving wires end, so stuck it there to do so. All in all, I love the end result, and am definitely going to incorporate this pendant style in different things. But yes, here is what I’ve been working on recently! I need to still take pics of the loose wrapped stones, but I’ve been crazy about just using wire, and a minimal amount of stones as of late, so figured I’d share these first. Must be the Bohemian inside of me coming out, but I just really love this style of pendant, and can’t wait to make more! I just finished up a craftsy class on making wire frames too, and have been practicing those, so I also can’t wait to make some pendants with those frames! I’m beyond excited, have been so anxious all week because I did a major, 150 dollar shopping spree for a ton of beads, wire, and loose cabochon gemstones to play with. Two of the packages have already been delivered, and I’m just waiting on the third one (ironically, the one with my ring mandrel and draw plate in it, along with all my beads lol). On Saturday, I’m going to pick up all of my stuff, and then let the jewelry making shenanigan’s recommence! I have so many ideas for so many projects, some design experiments I’ve been jotting down to try, and finally, I get to make my own rings! I have been wanting to be able to make some for months, and now with a ring mandrel I will be able to get on the ball with that 😀 I feel like I should probably start selling these things, because otherwise I’m just going to be swimming in a sea of beads and cabochons haha. I got some really pretty dagger beads, some seed beads in different colors, and some dragon scale beads, as well as some rainbow moonstone, blue lace agate, termalated quartz, and Lorimar stones. I’m especially excited about the larimar: I have been wanting to work with some for ages! And I found some great suppliers I am definitely going to be reusing in the future, so happy with their customer service! I tried to diversify my color spectrum a bit, but in the end I wound up with a lot of greens, blues, pinks and silvers haha. But not a biggy, because those are all my favorite colors, and I already have some darker colored gemstone beads I can tinker with. So yeah, I’m so so so excited! Saturday can’t come soon enough. 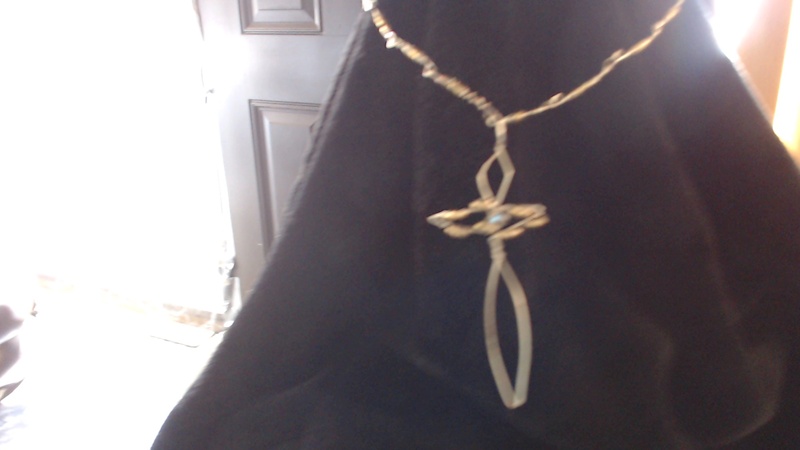 In the meantime, I’ll be organizing things, and also in the meantime: here’s a picture of a sword pendant and necklace I made a while back to celebrate my supply run!